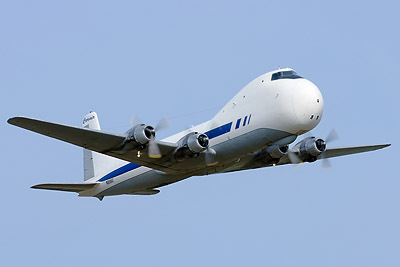 On 31 May 2007 I received an email with shocking news: ATL-98 Carvair N898AT, one of only two flying examples of this type left in the world, had met with a tragic end the day before, on 30 May 2007. Unfortunately this first email did not contain any other information, but in several follow-up emails I received details about the accident. Below are some quotes from those emails (in grey). 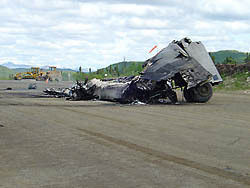 The crash scene shortly after the accident on 30 May 2007. 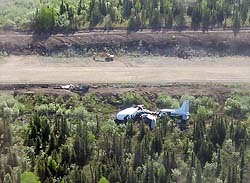 Carvair N898AT lies next to the Nixon Fork Mine airstrip, while the burnt remains of the right wing are still on the runway. Photo by Brian Martin. Click on the photo for a larger image. Roger just got her flying on Tuesday and Wednesday was her last flight. 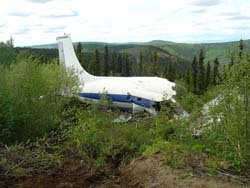 The pilots were fine, they were picked up and taken to Fairbanks. It happened at Nixon Fork Mine near McGrath, Alaska. The strip is notorious. There is a hill at the south end of the runway which forces everyone to land to the south. The winds are treacherous and unpredictable. As they were approaching to land, they had a tail wind and were trying to come in as slow as possible. They caught a down draft and clipped the end of the runway with the right main and the rest is self explanatory. You won't believe this but this is the second Carvair to crash up there. Along with a DC-6, DC-4 and a CASA. Upon impact the right wing separated from the fuselage. It remained on the airstrip and burnt, while the rest of the aircraft continued to slide across the strip making a nearly 180-degree turn, and then rolled down the runway embankment. There it came to rest, completely wrecked and with the nose pointing in the direction it came from. The cargo, consisting of 3,000 gallons of fuel in fuel bladders, remained intact. The accident happened around 12:00 local time. The National Transportation Safety Board's official preliminary accident report can be found here. 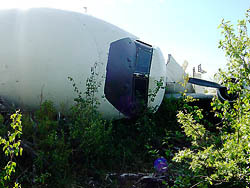 The Carvair was flown by Brooks Fuel Inc. of Fairbanks, AK, and the company's president, Roger Brooks, was one of the pilots when it crashed. 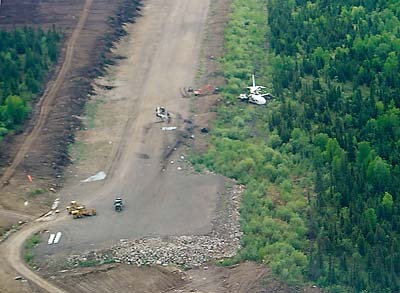 The airstrip at the Nixon Fork Mine (FAA code AK40) is a fairly short one, making operations in and out of there with larger aircraft such as the Carvair even more difficult. The strip is located 28 miles northeast of McGrath, AK, at coordinates 63.23N 154.76W. I received some photos from Brian Martin, the pilot who flew the two Carvair pilots back to Fairbanks after the accident. The first photos were taken on the day of the accident, the others during the next few days. All photos copyright by Brian Martin and published with permission. Click on the photos for a larger image. The right wing separated when the main gear clipped the rocks at the beginning of the runway. It remained on the airstrip, where it burnt. Photo taken 30 May 2007, by Brian Martin. Fuselage broken in two, tail end shown here, still relatively intact. Photo taken 30 May 2007, by Brian Martin. Belly view of the forward fuselage. The pilots (among which Roger Brooks himself) were lucky to walk away from this scene uninjured! Photo taken 01 June 2007, by Brian Martin. 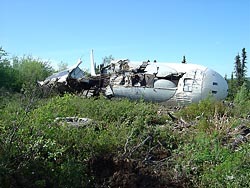 Amazingly, the cockpit was about the only section of the aircraft to survive intact. 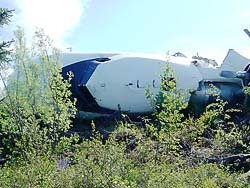 Note the No.2 engine underneath the wrecked fuselage. Photo taken 01 June 2007, by Brian Martin. Three days after the accident. The strip has been cleared again, the remains of the right wing shoved aside, but the wreck of N898AT was left untouched. Photo taken 02 June 2007, by Brian Martin. Looking a dying aircraft in the eye... A very sad sight. Photo taken 30 May 2007, by Brian Martin. N898AT had just celebrated its 60th birthday last year. Sixty interesting years, which took it to many corners of the globe. The aircraft was originally built by Douglas as a DC-4-1009 (msn 42994) and delivered to Det Norske Luftfartselskap (DNL) on 24 June 1946 as LN-IAE. The airline later merged with SAS, and in 1956 the aircraft moved on to serve with Japan Air Lines as JA6012 and Korean Air Lines as HL4003, before ending up with Ansett-ANA in Australia as VH-INK in 1964. In 1965, Ansett had the aircraft converted into an ATL-98 Carvair by Aviation Traders Ltd., becoming Carvair #20 (out of a total of 21 Carvair conversions). It continued to fly with them until 1974, when it was sold to Australian Aircraft Sales. In 1978, it went to New Zealand to fly with Nationwide Air as ZK-NWA. Carvair N898AT seen in its better days, flying with Brooks Fuel out of Fairbanks, AK. Photo taken at Fairbanks on 8 June 2006 by Aad van der Voet. Click on the photo for a larger image. Its North American career started in 1990, when it was acquired by Hawaii Pacific Air and registered as N5459X. Seven years later it went on to Hawk Air as C-GAAH, and finally to Roger Brooks as N898AT in late 2002. He did a magnificent restoration job on the aircraft, allowing me to photograph it in all its glory in 2006. As said before, N898AT was one of only two airworthy Carvairs in the world, the other being N89FA "Fat Annie" (msn 27249, Carvair #9), which is usually based in Texas. There is another Carvair at Rand Airport, Johannesburg, South Africa (9J-PAA, msn 27314 and Carvair #21, the last one converted), but this aircraft is currently not flyable. It was last flown in 2005 and is now stored without engines, but restoration to flying condition is probably still possible. Amazingly, there are no ATL-98 Carvairs preserved in museums anywhere on the world. This is an oversight which will hopefully be corrected before it's too late. A lot of interesting photos and info on this aircraft can be found on various pages at Ruud Leeuw's website. Of particular interest is this page by Australian aviation historian Gil White, who specialized in the history of the Ansett Group. My thanks go to Brian Martin for the kind use of his photos.